Tag team with other monsters in an attempt to take down all other monsters and destroy everything in sight. 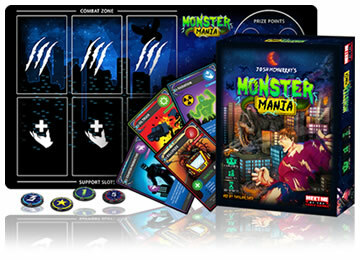 Monster Mania is a free for all battle game where you'll have to manage health and damage amongst other special action cards. Players use cards, playmats and tokens to help the game move along. Monster Mania is a fun game where you get to throw oil trucks and cruise liners. You'll use the aid of military aids and power plants. You'll topple buildings and evade damage. Great for one to six players and won't take all day to play. Give Monster Mania a try today. Review Completed (2018-09-17) Get your "destroy on" with Monster Mania. This tabletop game, comprised mostly of cards, a few tokens and playmates, has amazing art work. We thoroughly enjoyed the creativity and colorful cards. This game carries the theme of destroying monsters very well. The diverse card choices and fun objects made this game a real treat to play. We’ll try to keep our thoughts about the game quality brief. They may even be irrelevant since this was strictly a prototype game with plans to increase quality. Compared to some games we’ve reviewed, this game is made from a middle to low grade manufacturer. The playmates have us really nervous that they will split since we had to really work to get them to flatten out. They are stored folded in the game box so we don’t quite know how long they will last. The main thing that really bothered us about the game components quality was the tokens looked great on one side (though extremely thin) but on the other there was a huge misalignment with the graphics vs. die cut making the image about 1/16" of an inch off. This doesn’t seem like a lot but when the token is only .75" in diameter it made them look really tacky. There, we’ll stop so we can get back to this great game. We were blown away with the possibilities with this game. The game rules, though lacking various examples of game play images, is chuck full with different playing options. You can play as a group up to 6 players, play in a solo mode and even play in a co-op mode scenario. There are even various achievements you can mark off in the rules book making it a gaming journal of achievements. We thought this was a fun bonus to the game that focuses your attention on a certain way to win. This also helps the drive to keep playing over and over without it getting old. We also liked how you had to tag team with other monsters to take your opponents down. Playing Monster Mania was a lot of fun. Learning how to play took a few minutes and with the help of the condensed rules cards we had everything we needed to keep playing. The game mats really help organize the flow of the game. There is a lot of reading that happens since you’ll need to know what each card is capable of. This is not a casual gamers card game and you’ll need to be pretty interested in tabletop games to get into this game. Having said that, if you love monsters, resource / attack / defend type card games, this is the game for you. Defeat a set number of your opponent's monsters and you'll win the game. You'll get 210 cards, 45 attack points, 46 damage tokens, 26 turn/usage tokens, 25 prize tokens, 6 instruction cards, 6 playmats and the official Monster Mania game rules and instructions. 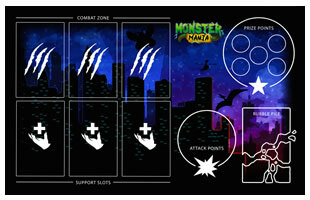 Please keep in mind that the official Monster Mania dice-card rules and instructions could be different depending on the game version you have. 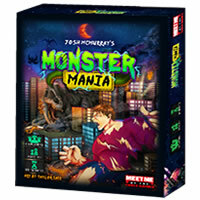 The rules below are some of the exact directions on how to play Monster Mania. Share with us your comments, funny stories, tips, advice, strategies, creative ways to play, questions about how to play, problems with the rules or anything you want about Monster Mania. All submissions will be reviewed within 24 hours. Click here to add your Monster Mania comments.